How can art be understood as a tool for understanding foreign cultures? Why do cultural values play an important role in threshold countries undergoing modernisation? What can art contribute to a country’s public image? 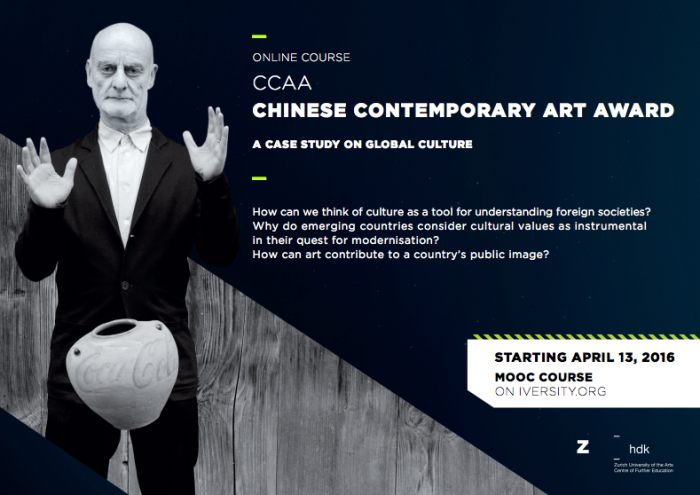 Based on a case study about global culture, the Chinese Contemporary Art Award online course develops possible answers to these crucial questions. Divided into six chapters, this new course is aimed at curators, art collectors, artists, journalists, culture workers, researchers, and members of the wider public interested in these issues. Interviews and background information offer participants insights into the Chinese art scene, its protagonists and its institutions. Coursework focuses on the Sigg Collection’s Chinese Contemporary Art Award and on the M+ Sigg Collection, which is part of Hong Kong’s M+ Museum, designed by Swiss architects Herzog & de Meuron. Speakers include Ai Weiwei, artist, Anna Li Liu, Director «Chinese Contemporary Art Award», and Pi Li, curator M+ Museum. The course also offers online meetings with curator Kathleen Bühler, art collector Uli Sigg, and cultural advisor Michael Schindhelm. The programme is accessible publicly and free. The online format facilitates participation beyond time and location constraints. Participants may pursue a Certificate of Accomplishment (119 Euros), which is awarded by ZHdK and Iversity following an online examination. Zurich University of the Arts (ZHdK) is launching the first-ever MOOC (Massive Open Online Course) on Chinese contemporary arts developed by a Swiss arts and design university. The English-speaking online course Chinese Contemporary Art Award – A Case Study on Global Culture will launch on 13 April 2016 on the iversity.com e-learning platform. The course offers exclusive contents and interviews about the evolution of Chinese Contemporary Art over the past 40 years. The course thus provides unique insights into the emergence of one of today’s most influential art systems. Coursework considers the example of the Chinese Contemporary Art Award (CCAA), established by Uli Sigg in 1997. Administered by the ZHdK Further Education Centre, the course is based on research undertaken at the Institute for Contemporary Art Research (IFCAR). Its presenters are Michael Schindhelm, Elisabeth Danuser and Renato Soldenhoff. It is offered in association with Connecting Spaces Hong Kong – Zürich, ZHdK’s Hong Kong hub.